Ladybirds are one of the first types of insect most children learn to recognise. Most people recognise these beetles straight away with their bright, contrasting colour patterns and shiny elytra. Many people are also aware of the beneficial role they may play in gardens and horticulture, feeding as both adults and larvae on plant-sucking insects such as aphids. However, ladybirds are a lot more diverse than many people realise. The great majority of species in the ladybird family Coccinellidae are not brightly coloured, and many of them do not feed on aphids. Rhyzobius cf. chrysomeloides, a typical member of the Coccidulini, copyright Mick Talbot. 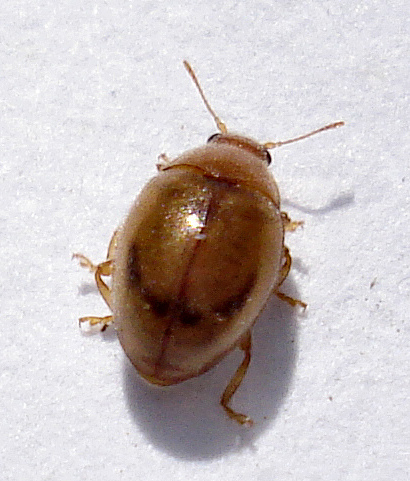 The ladybirds of the cosmopolitan tribe Coccidulini are mostly small species; many are dully coloured, though some are more distinctly patterned. As recognised by Ślipiński (2007) in his revision of the Australian Coccinellidae, the group is a diverse one and difficult to define; common features of its members include pubescent rather than shiny elytra, and certain features of the genitalia. A phylogenetic analysis of coccinellids by Seago et al. (2011) did not resolve the Coccidulini as a monophyletic clade, suggesting the possibility that they may represent a basal grade of unspecialised taxa, but no reclassification of the group appears to have been proposed as yet. Stethorus punctillum, copyright Gilles San Martin. The most familiar ladybirds are more or less hemispherical, but coccidulin species may vary in shape from rounded to oblong, with the body convex to flattened. The Tasmanian species Nat vandenbergae* particularly stands out in this regard, being oval and flattened with relatively long legs and antennae, and at first glance might be mistaken for a chrysomelid leaf beetle rather than a coccinellid. 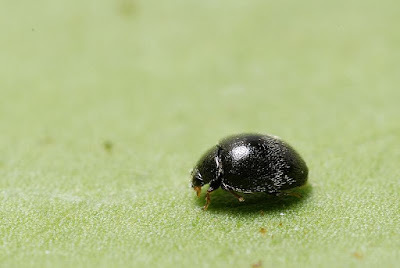 The rounded species of the genera Stethorus and Parastethorus include some of the smallest of all ladybirds, some being only a millimetre or so in length. *Yes, the genus name for this species is Nat. Other coccidulin genera named by Ślipiński (2007) include Roger and Robert. 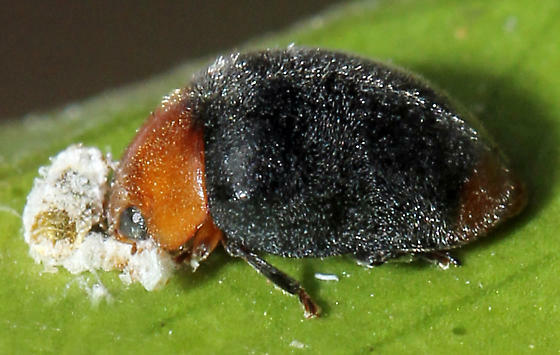 A mealybug destroyer Cryptolaemus montrouzieri engaged in destroying a mealybug, copyright Cynthia Bingham Keiser. Being so small and easily overlooked, the life habits of many coccidulins remain poorly known. Many feed on aphids or scale insects in the usual ladybird manner. The orange-and-black Cryptolaemus montrouzieri was one of the first ladybirds to be deliberately used for biological control of pests; originally native to eastern Australia, it has been introduced to other parts of the world such as the United States to help control mealybugs. The tiny Stethorus and Parastethorus species feed on spider mites (Tetranychidae), species of which may similarly cause damage to crops. But other coccidulins have more unexpected diets. The larva of another Australian species, Bucolus fourneti, is a specialised predator of ants, lying in wait under the bark of Eucalyptus trees to ambush its prey as it passes by. Seago, A. E., J. A. Giorgi, J. Li & A. Ślipiński. 2011. Phylogeny, classification and evolution of ladybird beetles (Coleoptera: Coccinellidae) based on simultaneous analysis of molecular and morphological data. Molecular Phylogenetics and Evolution 60: 137–151. Ślipiński, A. 2007. Australian Ladybird Beetles (Coleoptera: Coccinellidae): Their biology and classification. Australian Biological Resources Study: Canberra.